Think the whole rosé cider thing is winding down? Think again! In addition to familiar brands getting new looks (like Citizen Cider’s bRosé in cans) and new fermentation experimentations (like Shacksbury’s Pét-Nat rosé ciders), cideries everywhere are adding perky pink ciders to their lineups. Another new one on the scene is Hail Mary, a rosé cider from Windfall Cider, an urban cidery in Vancouver, Canada. British Columbian apples and ripe berries blend in this crushable cider that offers notes of apple, rose petals and green melon. 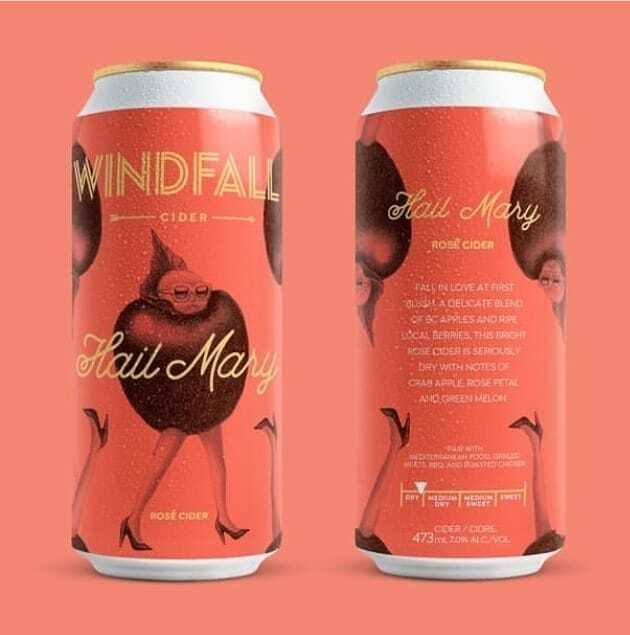 Windfall, which launched in 2018 with one core cider, Jackpot, is adding Hail Mary as its second flagship offering. The Nairns work with community farmers to source apples for their ciders, and for Hail Mary, specifically, they fermented a blend of McIntosh, Granny Smith, Red Delicious, Spartan and eight other varietals along, with Western Canadian Saskatoon berries, which lend color, tartness and tannins. This blush-colored cider, which clocks in at 7% ABV, pairs well with Mediterranean food, grilled meats, BBQ and roasted chicken. The playful can design and illustration is by Philadelphia-based illustrator Armando Veve, under the creative direction of Vancouver’s 123 West Communications. Find Hail Mary and Windfall’s other ciders at various bars, restaurants and shops around Vancouver.